Code name: Snoopervisor/The Notorious D.O.G. Representative quote: "Two things are infinite: the universe and my love of cheese; and I'm not sure about the universe." As Angela’s longtime fluffy companion, Doodle takes a keen interest in the day-to-day operations at Point A headquarters. He is our official Four Legged Overseer and spends most days working the velvet rope at Point A Media’s front door, vetting all visitors and serving as a sort of canine shipping-and-receiving department (which is a fancy way of saying he pesters the Fed Ex guy until he gets a treat). In the interest of team-building Doodle makes a point to request cheese from any and every person who ventures near the refrigerator, and in the interest of work/life balance he demands scratches, pats and pets from whomever happens to be on the verge of productivity. Doodle enjoys lying on rugs, laying his head on laps, riding shotgun and creating bespoke olfactory sensations during important meetings. 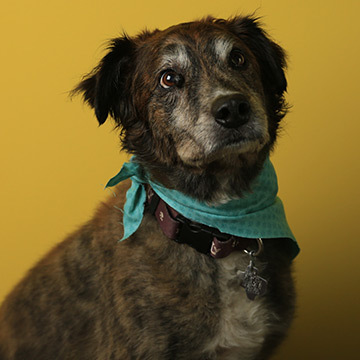 With his steady demeanor and gentle wisdom, Doodle helps us all keep focused on the big picture: everything is better with a little cheese and there’s never a bad time for a nap.